An album of rare class and maturity. Last years ‘Pressure And Time’ album together with high profile tours with Judas Priest and a show stealing double slot at the High Voltage Festival really put Rival Sons on the map. Hailed as the next big thing, the pressure was on Rivals Sons to match the expectations and deliver on the potential shown so far. ‘Head Down’ not only matches ‘Pressure And Time’ but exceeds it in almost every way. The song writing is stronger, the performances exceptional and the overall production is at a much higher level. 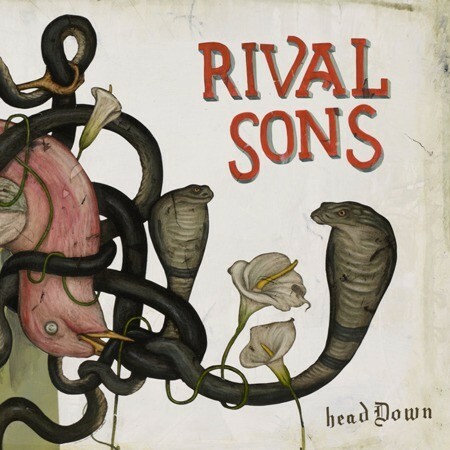 Rival Sons have really come of age with ‘Head Down’. The variety of the material ensures that the album never outstays its welcome. From the groove laden swagger of the opener ‘Keep On Swinging’ to the foundation rocking ‘You Want To’, there`s enough punch to keep the rockers happy. Yet the album also dips into more trippy `60s psychedelia at times with the sweet melodious ‘Wild Animal’ or ‘Until The Sun Comes’ adding a feel good sun kissed sheen to the album. ‘Jordan’ and ‘True’ see a more introspective side of the band with a stripped down acoustic style that Led Zeppelin excelled at while ‘Manifest Destiny Parts 1 and 2’ sees the band really spreading their wings musically with some extended jamming backed by a colossal riff. Jay Buchanan, who really excels throughout, is cut from the same cloth as Robert Plant and Paul Rodgers with the passion and range to match both. His cocksure attitude and sparkle marks him out as a star in the making. As all singers do, Buchanan has a fine foil by his side in Scott Holiday whose chops and solos rekindle those memories that made you fall in love with rock music all those years ago without ever sounding dated. It would be easy to focus on Buchanan and Holiday as the driving force of Rival Sons but the rhythm section featuring drummer Mike Miley and bassist Robin Everhart provide the solid foundation on which everything is built. When they lock tightly together, they provide the framework in which Buchanan and Holiday weave their magic. ‘Head Down’ is an unqualified success, an album of rare class and maturity with an imposing collection of music that can only serve to enhance the growing reputation of Rival Sons. With an album of this quality it is only a matter of time before they really do hit the big time.